This little creature sat amazingly still while I took many photos. Sometimes I choose the photo, and find a quote to go with it. Sometimes I choose the quote and look for a photo. This is one of the times I chose the photo first. It wasn’t easy to choose the quote for it. The stillness of the insect was beautiful, though, and the memory of how it didn’t fly away as I took photo after photo. The cool serenity of the evening when I was taking the picture was beautiful too; that wonderful glare-free light that bathes everything just before dark settles in. It all comes back to me when I look at this shot. Today you will be surrounded by small glimpses of beauty; moments and memories that are easily missed. Look closely! It’s a stunning shot, Julia! We are in Outer Banks on vacation so think we’ll look huge and awesome today at majestic ocean! Heading home tomorrow! Hi Nancy! Wow, you guys were only three hours from us. How did you like OBX? We have been a couple of times and really enjoyed it both times. Keep saying we are going back. I am looking forward to seeing the guys’ Christmas photo this year. They will be young men and not kids anymore! Hope you had a nice trip home. You’re right, they’re pretty and maybe, pretty weird looking. The road up to my grandpa’s house on the farm was simply cut through a swath of tall growing wheat. I remember once, one of the hundreds of dragonfly’s zoomed in the window and landed on my chest. I looked down and freaked out, I think I was maybe 8. After that, I’d run inside at the first sign of one. I’m better now but still don’t want to have one on me. HA! K, that was our fence, but for some reason it looks way more red in the photo than it does normally. Maybe it was the evening light. I used to have a costume jewelry pin of a dragonfly (remember the 60’s when we wore those on our coats?) but it was not as ugly scary interesting as the real thing. That pin was about as close as I would have wanted to get to one — I would have totally freaked out too if they landed on me. YES your projects are full of itty bitty eye candy! Each time I look I discover something different. I will never forget the tiny message I found on one of the first tiny boxes you sent me: “miracles do happen” — and another favorite was the tiny letter “P” on the card you sent me after Pasha died. I have always loved miniature anythings, so I love to look at your creations again and again. I love those pins too. I would wear them more often if I took the time to put them on. We used to exchange them as gifts at Christmas when we were young. Do you remember in the mid 60’s when those little circle pins were all the rage? Will do — but I plan to draw the line at bell bottoms and tie dye. At a certain age, I just can’t get away with some styles anymore. 😀 I can remember when my favorite jeans were about 14 inches wide at the bottom hem. Boy, did I think that was cool. I’m so glad to be an old woman now! Wow, what a compliment! Thank you. I don’t mean to be putting myself down when I say I’m old. As one who was always called “childish” I relish being “of a certain age.” I hope we can reclaim the term “old woman” and wear it with pride as it once again begins to garner the respect it deserves. I should put that TV series on my list of things to watch on DVD someday. I love costume dramas, even fairly recent ones. 😀 I imagine there are many warehouses full of fun props and costumes in LA — just think how much fun we could have if we could be turned loose in there to play dress up. Talk about photo ops! It would be like going to be best vintage store ever. It might even be fun to get paid to shop for props. I wonder if there is such a job? Oh boy, that’d be a great job! We could be detectives, hunting down leads, going to yard sales and bring back the loot. LOL, back to reality. I do think you are in the job you were born for. I’m so glad you are enjoying yourself – I’m sure their business is BOOMing since you came along! The best walk is with a small child. They want to stop & touch, see, explore. I have had many beautiful “sightings” from a child’s viewpoint. Reminds us to enjoy God’s Creation all around us. Thanks, Julia, I will look closely! Mary Ann, kids are great that way. They are closer to the ground and so they see things we miss. Also, they see everything from a different angle. I love to get on the floor and play along where kids are playing. It makes for some interesting camera angles too! Hope you have a wonderful weekend…sending love and hugs. 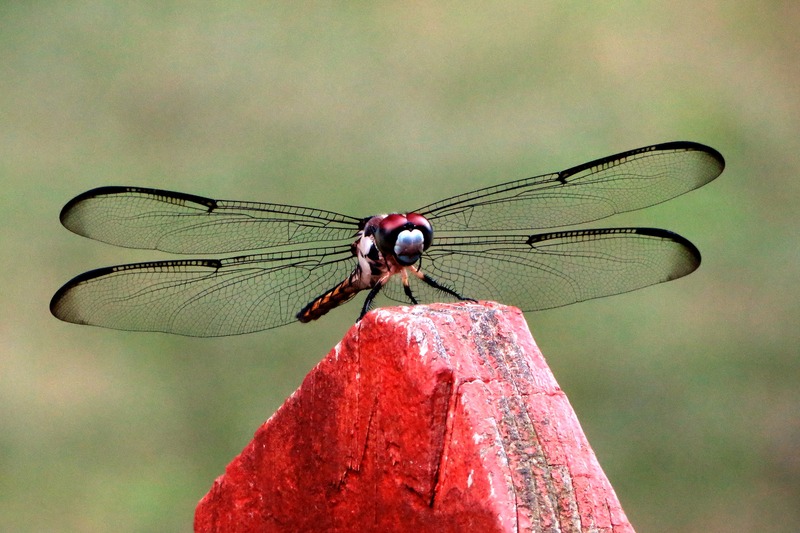 But I’ll just bet you that to another dragon fly, that dude (or gal) is smokin’ hot! I can’t count on all my fingers and toes the number of people about whom I used to think they looked a “little funny” that look like God to me now that I’ve gotten to know them, have experienced something of their inner nature. And how many I thought magnificently proportioned that turned out inside to be quite something else . Thankfully, my wife hopefully sees it the same, for I’m pretty sure I’m not all I used to be (or ever was!). Jack, you’re right — and probably that dragon fly was hanging around hoping to be spotted by a dragonfly dude or gal. I too can remember some people — guys in particular — who became more and more handsome as I got to know them. I am sure your wife does see it the same. Women tend to be good at that. Besides, as I always tell Jeff, age is attractive to me; most people become so much more interesting as they grow older. Hope y’all have a great weekend! Merry, the eyes remind me of that old horror movie “the fly” or the remake of it that came out a few decades ago. As with so many insects, they are best appreciated from a distance! There is something cartoonish about those eyes. They are so big and exaggerated and weirdly colored. Have you ever seen those photos in Reader’s Digest that are taken of some everyday object from a very close angle? Often it’s hard to figure out what they are. This page has some that are along similar lines. Taking pictures helps me slow down and notice things. Marlene, I have the same problem with magazines. I have way too many, because can’t stand to throw them away without reading them. To me, they just get more interesting as they get older. I am trying to convert to the digital edition for most of them, but there’s nothing like having an actual magazine in hand. Reader’s Digest is special because I have loved reading it ever since I was a young girl, and Daddy used to get me a subscription each year. Two days after he died I got the notice in the mail that he had given me another year (he always renewed it early though the subscription ran through December). Of course that was quite an emotional moment for me and I’ll save that particular gift notice the rest of my life, I’m sure. I’m glad you enjoyed the online photos! Hey, that’s a great idea to take a photo of an article or recipe that you like. Much quicker than scanning it. I too am in recovery for the “someday I’ll read/sew/craft this” syndrome. 😀 Even if there is no cure, there are treatments that help. Meanwhile it’s nice to know you understand! Thank you for the reminder to look for beauty in the small stuff. I need some beauty and smiles today. It is so wonderful that the little guy sat still for you. It must be nice to be able to look out on the river from work. WOW, I can’t believe the chocolate lasted that long — I hope it was still good. I’m sure you can imagine that I don’t typically get the chance to find out how long chocolate might last. 😀 We are doing OK. For me, the sadness comes and goes; I stay busy and that helps, but then there are so many things — photos, gifts, something I hear or see, all of which remind me of Daddy and I start missing him all over again and the pain feels very fresh. I’m sure that’s the sort of thing that gets easier over time, but will never completely disappear. That salted caramel cake sounds perfect! Root beer chicken or strawberry BBQ sound exotic but it’s hard to beat beef in a crock pot, especially with gravy (I used to make mine with onion soup mix and cream of mushroom soup — that tells you the limits of my culinary skill). Hope you have a wonderful week coming up. Hugs to Mary and Ms. Ella.